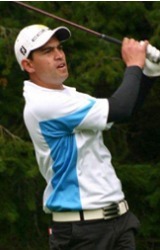 Napier Golf Club Professional Andrew Henare won the Hawera Pro-am today with a stunning six under par 66. Andrew took time away from his busy role at the Waiohiki club in Napier to support the Hawera and New Plymouth events and drove over this morning to compete. Henare finished one stroke ahead of young Christchurch professional Oscar Cadenhead on 67 and in third place Taranaki local Dominic Barson was in third place on 68.